TLS from the United States Conference of Mayors encouraging House of Representatives members to vote for the establishment of the Department of Housing and Urban Development. 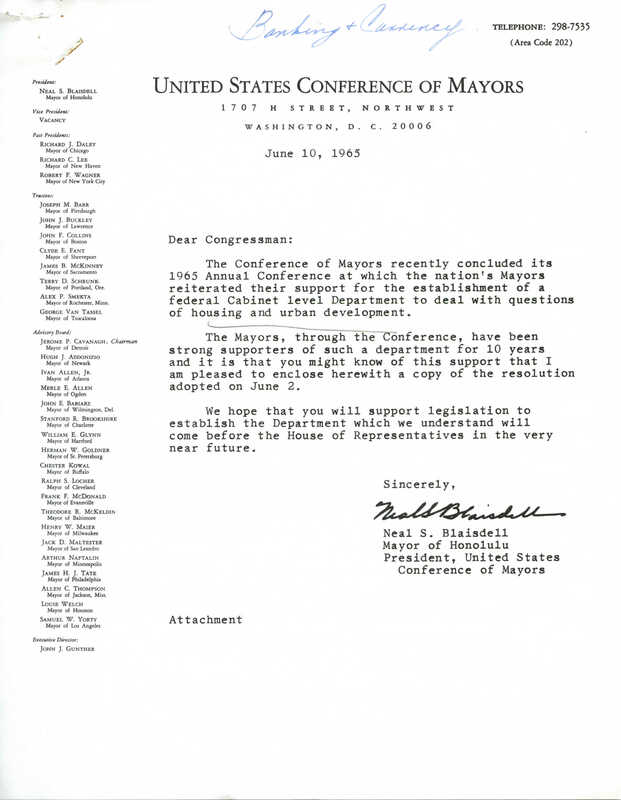 An enclousure shows the resolution adopted by the 1965 Annual Conference of Mayors which supports the creation of the Department of Housing and Urban Development. Albert, Carl, 1908-2000. "Letter from the United States Conference of Mayors, with enclosure." Original Letter. Sent from the United States Conference of Mayors. Carl Albert Congressional Papers, Legislative Series, Box 87, Folder 28, Carl Albert Center Congressional Archives, University of Oklahoma. Accessed 21 April 2019. http://acsc.lib.udel.edu/items/show/276.